Yes, it is time to review another Audio-Tehcnica product! This time, it is an awesome audio product with the ATH-WS990BT Solid Bass Bluetooth headphones! So, what does this have? Let’s not bury the lead as it has 53 mm drivers, and not just any drivers, but Deep Motion Drivers. They have large, high-flux magnetic circuitry, made for low and high frequencies. So yes, the sound is good. However, if you are worried about having too much sound and drowning out the world, you don’t have to. Yes, it has noise-cancelling as well as hear-through functionality, which means you can chose the level of blocking out reality. I have to admit, this was the first time I have seen this option on headphones, and it is worth bragging about. As far as the rest of the features are concerned, let’s talk about the controls and microphone located conveniently on the left earcup. Other features are the 30 hours of continuous wireless use, which is good for 1,000 hours of standby. 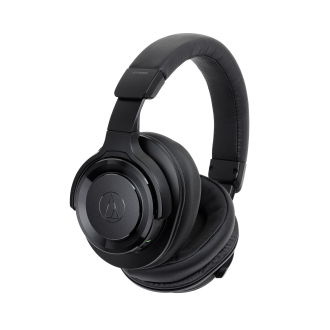 It is available on the Audio-Technica website in any color, provided it’s black. Yeah, I think it was Henry Ford who said that about his automobile, but check this one out for about $249.00 if you want some very decent sound for your money.